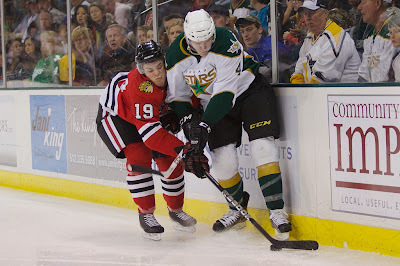 There's just something about the matchup between the Stars and IceHogs that turns every game into a high scoring, come from behind affair. Tonight was no different as the Stars gave up a 3-0 lead to fall 5-3 in their regular season finale. Amazingly, it was the fourth straight game in the season series between the two where the home team dropped a three goal lead to lose. "We just didn't play well enough," said Coach Desjardins. "[Rockford] played with desperation. We have to defend better; we gave them too many chances, and that's not what we do." The game had a combined 101 shots, 54 of those coming off the sticks of Rockford skaters. "You can't give up  shots at home," said Luke Gazdic, who scored his fourth of the season in the game. "We need to talk in the zone and have communication. They just worked us." Texas didn't clear out in front of Cristopher Nilstorp, who faced a season high in shots. The number of quality chances Texas was able to generate compared to the IceHogs was part of the issue. "We didn't put up much on Simpson for quality chances," said Desjardins. "We had a few late but not until they got up on us." Despite the loss, Texas did clinch the top seed in the West today with a Toronto loss. Veteran Francis Wathier added, "We can't perform like we did tonight in the playoffs. We'll be out in three games." The game's first goal came unexpectedly as Kevin Connauton collected a Radek Faksa faceoff win and dumped it in from center ice. The puck was misjudged by Henrik Karlsson and slipped past him for the 1-0 lead. The Stars poured more on the IceHogs in the second as two quick goals gave Texas a 3-0 lead. Scott Glennie went first just 22 seconds in. The rebound goal off the initial shot of Dowling was shortly followed by Gazdic's tally. Curtis McKenzie was trying to slip the puck across the slot to Faksa, but the puck was deflected straight to the stick of Gazdic, who made no mistake in finding the net for the 3-0 lead. From there, it was all IceHogs. Kent Simpson relieved Henrik Karlsson in net for Rockford and had a dazzling 32 save performance for the win. "We had the game on the line and our foot on their throats," said Gazdic. "We couldn't put it away." Adam Clendening went first, collecting a botched clearing attempt and scoring on a doubly-screened Nilstorp. Captain Martin St. Pierre made it 3-2 early in the third period with another unassisted goal. Just 43 seconds later, Clendening found Svendsen completely uncovered on the left wing side. Svendsen bang home the puck into the empty net for the three all tie. Ben Smith polished off the night's scoring with two more as Texas lost just their third game all year after trailing in the second intermission. Obviously this was not the same team that Texas will ice when they start the playoffs against a yet-to-be-decided opponent later this week. The Stars scratched Morin and Fortunus to rest them and are hoping for the recovery of injured players such as Sceviour and Ritchie. Still, it's a motivational point for their Coach: "It shows we have work to do if we want to do well in the playoffs." What happened to Sceviour and Ritchie? Really? Nice job "backing" into the post-season. Houston & Rockford had more to play for - but 5 unanswered goals? C'mon. Stars! !